The technology could work in different ways. 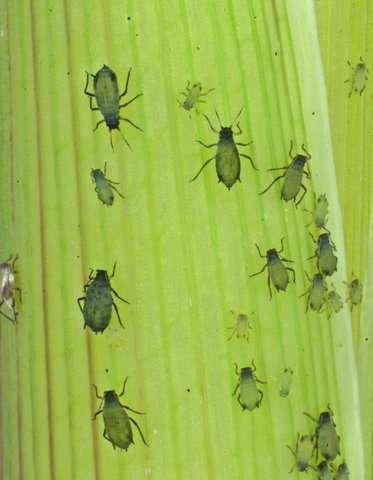 In the first phase, aphids—tiny bugs that feed by sucking sap from plants—infected plants with a virus that temporarily brought about a trait. But researchers are also trying to see if viruses can alter the plant’s genes themselves to be resistant to dangers throughout the plant’s life. Kaebnick questioned how well the viruses and insects carrying them could be controlled. “When you are talking about very small things—insects and microbes—it might be impossible to remove them” once they are introduced into farmers’ fields, he said. Guy Reeves, a co-author of the Science paper and a biologist at the Max Planck Institute for Evolutionary Biology in Germany, says the technology is more feasible as a weapon—to kill plants—than as an agricultural tool. As a result, he said DARPA could be sending an alarming message regardless of its intentions. “Once you make those kinds of breakthroughs, you are in a new world. It’s a morally ambiguous place. You wonder, ‘Is this something that we should never do? '” he said. Featured image is from the phys.org.